Today Sabrina and I celebrated our four year anniversary together. We met on this boat, and this voyage is a product of our relationship… so I wanted to share a glimmer of how I feel. Sailing the Pacific can be extremely hard work… and I’ve never seen anyone work harder than Sabrina to make life wonderful for those around her. No matter the conditions, she can bake a quiche, clean a bilge, don a harness in a rainy night, organize thousands of photos, or chisel paint for countless hours. Although as captain, I am the one driving the boat, it is Sabrina who turns this trip from good to great. Like fairy dust, her joyful enthusiasm adds an extra twinkle of magic to even the most mundane moments. Now sprinkle that onto the exquisite vistas and experiences that we reach through sailing. Despite the laughably exhausting moments, we are rewarded with the most sublime moments. I am lucky beyond words to share them with her. 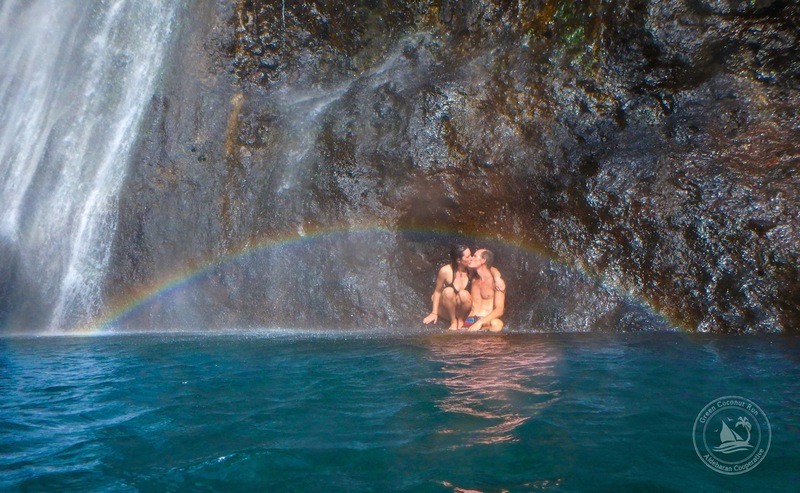 Like a kiss under a rainbow under a waterfall. I mean, seriously! Magic is possible. I love you Sabrina. Congratulation to both of you. We are enjoying reading your big adventure and jealous of this interesting trip. Happy Anniversary! Sailing the high seas itogether s the ultimate test of a relationship. You capture our precious Sabrina so well dear Kristian! Makes me miss you both all the more. What a beautiful picture too! This is so sweet! May you be blessed with many more magical moments. I remember Keri used to say, “you just need to get out of the house and go to the beach or hills and magical stuff starts happening”… spending time outdoors is key!! Wonderful tribute to 4 years together, may you both feel this way for a lifetime!! Sabrina, Matt & I cannot wait to meet you! Beautifully said Kristian. You are a beautiful couple and it was a joy to see, first hand, how you complement each other. You both have unique skills and when combined radiate a joyous appreciation of life. May that continue for the rest of your lives. Congratulations on your first four years together.